03/05/2014. THIS POST MAY CONTAIN AFFILIATE LINKS. READ MY DISCLOSURE POLICY. Here is an idea for those of you that might be looking for more natural productsfor your body and your home. 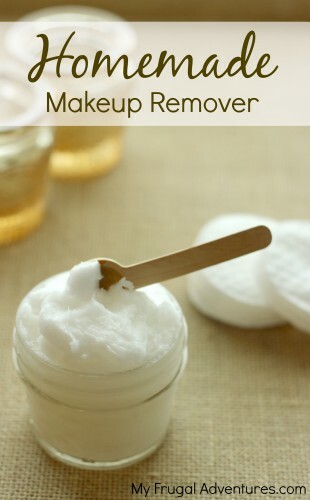 A very simple and all natural homemade makeup remover using just one ingredient you might already have on hand. The beauty of this is that it works incredibly well and really takes seconds- no complicated products to buy or steps to follow. 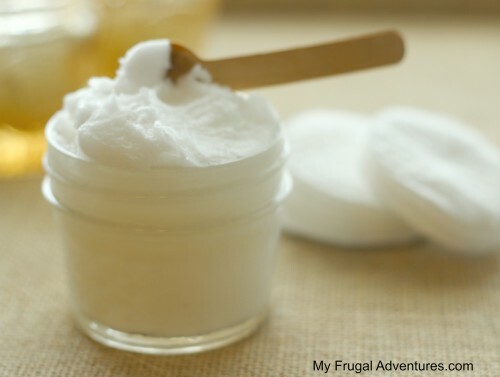 You simply need to head out to the store and pick up a jar of Coconut Oil- by now probably most of us have this in the pantry anyway because Coconut Oil is kind of magic in that it works very hard to do all sorts of cool stuff. If you are not familiar it is about $6 a jar at Trader Joes, Whole Foods, Sprouts etc… in the cooking oil departments. You can also get a good price online from Amazon here.) Try to find organic if you can it is usually the same price. 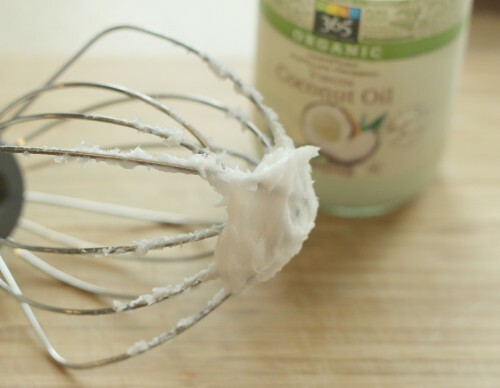 Now the only trick with Coconut Oil is that it will change consistency according to the season. When it is warm in summer you will have oil. In cooler months it is a solid like a pat of butter. For this application it is easier to use in a solid state so you might pop it into the fridge if yours is melted. You can literally scoop the coconut oil directly from the jar after you purchase but I prefer to take just one second to whip it first. Totally not necessary- just my preference. It makes a smoother consistency that is easier to handle. I just grab a scoop from the jar and spoon it into the bowl of my Kitchen Aidand then whip it baby! Just whip for a few minutes- it starts to look like frosting instead of Crisco. Now use a spatula to put it in a little jar and you are good! This is awesome to keep in the bathroom anyway because it smells good and you can use this for a zillion different things. Smear a little on your lips if they are dry, put a tiny bit on your hair to get out knots or tame strays (CAREFUL as your hair will look greasy so literally a tiny bit) or slather it before you shower for a deep conditioner, any dry spots on your skin rub it right in like lotion, put it on your cuticles… This little jar will work hard for you! Now as for the actual application- dip a little bit onto your fingers and smear it on your eyes- I sort of rub my lashes a bit to get all the mascara off. Rinse your face and then wash your face and moisturize as usual. I have extremely sensitive eyes and I wear contacts so I like to use a little cotton cloth (pictured at the top there) and I get it damp first. Then I dip the damp cotton cloth into the coconut oil and rub that on my eyes. Whatever way you prefer. I use waterproof mascara so I usually have to work on the lashes for just a second to get it all off and then I take the same cloth and swipe the black smears from under my eyes. Boom! You should have makeup free eyes! Easy peasy. Oh and even though you spent that $6 on the jar the portion you see below is about 1/4 th of the jar and this would last for ages. So give yourself an extra pat on the back for being frugal ;). The first time I tried this I used my regular makeup remover (Clinique) on one eye and this on the other. I was skeptical that my face would be greasy or it would hurt my eyes. I did not notice a difference in the effectiveness between the two products.